Manneco's new Cascade Building Front Wreaths are not your "flat doughnut" typical wreaths. 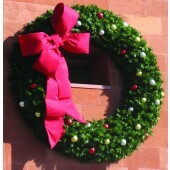 Instead, Manenco's Cascade Wreaths are a full bodied, 3-dimensional wreath made using a "caged" steel frame. These new Cascade Wreaths are so much more dense, lush and beautiful than all other "flat" wreaths! Our older "flat frame" styled wreaths are still available upon special request, however; our new Cascade Wreaths are now our standard for all building front wreaths - with a very few exceptions. 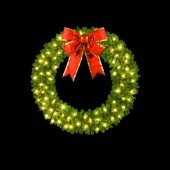 Choose the wreath with the garland, lighting, bow or ornament options of your choice and celebrate the holidays in style!